Cornbread, apple & cranberry stuffed pork loin is the winner of any dinner table with all the favorite ingredients of the season. Pork loin is sliced and opened flat, then stuffed with apple, dried cranberries, cornbread and sage, then rolled and roasted. I always like to come up with a new pork recipe this time of year and it usually (always) involves sage. 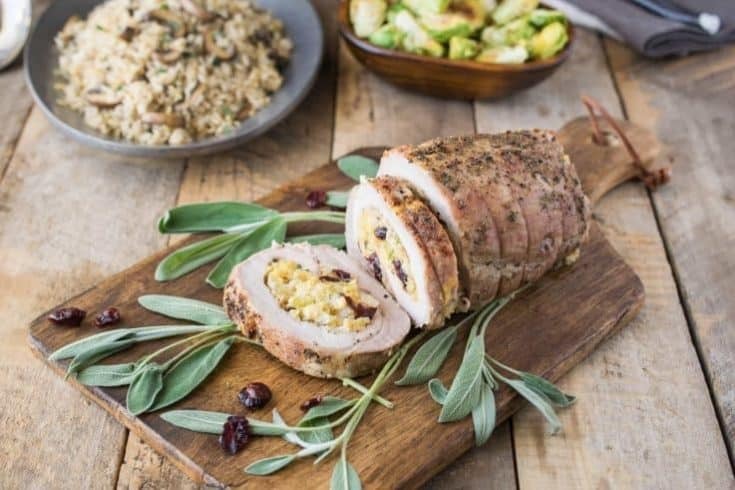 This cornbread, apple & cranberry stuffed pork loin is perfect for a family Sunday dinner or any of the upcoming holiday’s, with all the flavors of the season, pair it with your favorite vegetable and mash and you have a winning dinner. There is a little preparation involved when it comes to the meat. Don’t be scared, all you need is a cutting board and a sharp knife. I will be making a video tutorial for this, but in the meantime I’m going to describe it as best I can. We are aiming for a flat piece of pork. Pounding with a mallet will not work in this instance so we have to cut it like a jelly roll. 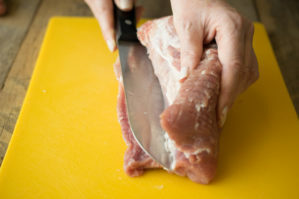 Referencing the pictures below, start on the right (if you’re right handed, start on the left if you’re left handed) about ¼ inch above the cutting board and slowly slice the meat. Slice and look, making sure you are keep the same thickness. Don’t worry if it’s a little off and uneven, you can fix this at the end. Continue cutting until the meat ‘unrolls’ and you have a flat piece. Mine was not completely even, so I took a meat mallet and evened it out. (you can also use a small pan or rolling pin). Now that the hard part is done, all you have to do is spread the filling out onto the pork, roll it up and tie it tight. Let’s talk about that filling. One of THE MOST favorite things I love to make this time of the year is my cornbread, onion and sage stuffing. It’s all I can do to get it onto the plates without eating it all. I am a fan of using the prepared cornbread box mixes for ease. You know how pork can dry out when you cook it? This filling keeps the meat moist and flavorful along with the tender, juicy apples and dried cranberries, this stuffing marries so well with the pork and hits every flavor note. I hope you try this recipe because it will become your and your families favorite meal. 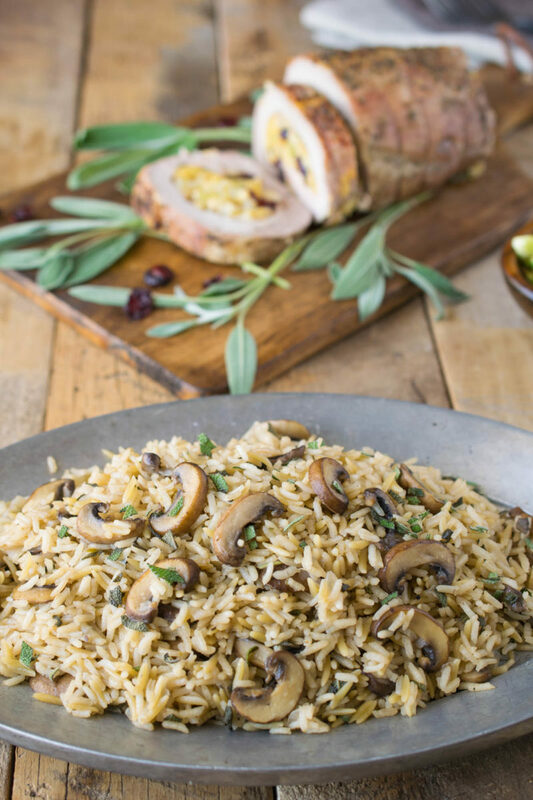 To complete this meal, I served it with Mushroom Sage Rice Pilaf and simple roasted Brussels sprouts with cranberry glaze (recipe link below). Oh and by the way, the pork leftovers make amazing sandwiches. If you’ve tried this Cornbread, Apple & Cranberry Stuffed Pork Loin or any other recipe on the blog then don’t forget to rate the recipe and let me know how it turned out in the comments below. I love to hear from my readers! You can also FOLLOW ME on FACEBOOK, TWITTER, INSTAGRAM and PINTEREST to see daily recipe updates. Pork loin is sliced and opened flat, then stuffed with apple, dried cranberries, cornbread and sage, then rolled and roasted. In a large skillet, melt the butter over medium-low heat. Add the apple, celery, onion and sage. Cook until softened, about 5 minutes. Add the chicken stock and salt, cook for 5 minutes. Add the cornbread, stir to mix well until all the cornbread has absorbed the liquid. Mix in the dried cranberries and allow to cool for 15 minutes. Cut the pork loin until you have a flat surface. Season with salt and pepper. Place an even layer of the stuffing all over the pork then roll up and tie with kitchen string. Place onto a baking sheet and season with salt, pepper and dried sage. Roast for 45 until the internal temperature reads 140°F on a meat thermometer. Remove from the oven, transfer to a cutting board and allow to rest for 10 minutes before slicing. I made this for a holiday dinner and was nervous about the cutting of the loin but it was easier than I thought (with a little hubby help). The cornbread stuffing was so delicious I wish I had made 2 of them so I could have leftovers. I’m happy it worked out well. Thanks for leaving the feedback. I mixed pilaf in it as well. I hope it turns out just as good. That sounds like a delicious addition, I hope you like it. Is it only one cup of corn bread? Hi Sherri thank you for asking. Yes, only 1 cup of prepared cornbread because the other ingredients really increases the volume. This looks amazing, Janette. The cornbread makes the stuffing such a great colour. Loving the pilaf on the side too! What lovely photos, Janette, of a really delicious-sounding recipe. I always get a bit ‘scared’ of cooking meat that isn’t chicken, for some reason, but this gives me confidence to branch out a bit. Wow, what a beautiful recipe. This would be perfect for company or the holidays! That rice dish looks amazing too! I love stuffed anything but your cornbread stuffed pork is perfect for this time of year, a must try! 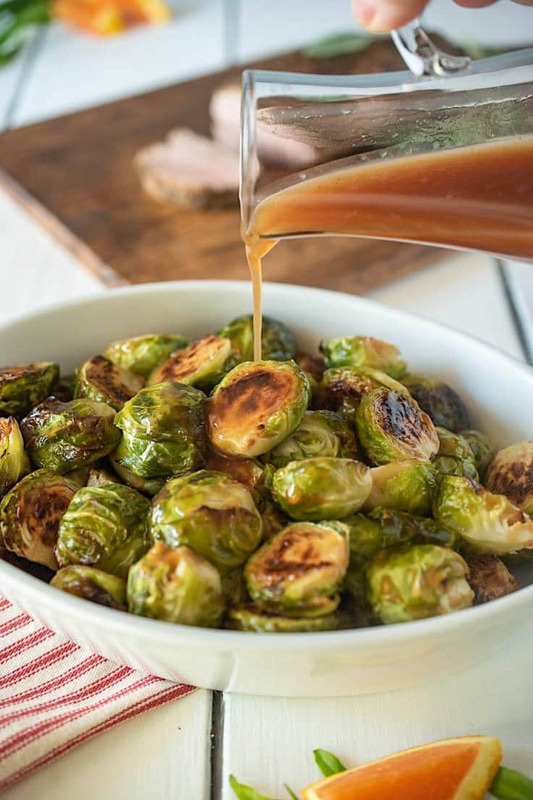 Perfect fall comfort food! And it’s gorgeous too! Wow!